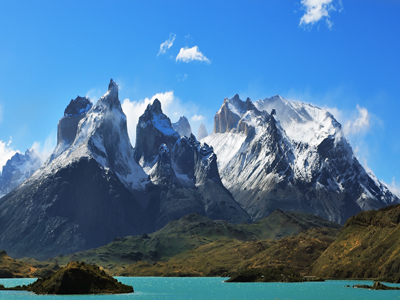 Explore the natural beauty and embrace the thrilling adventures of Chile an unforgettable trek! 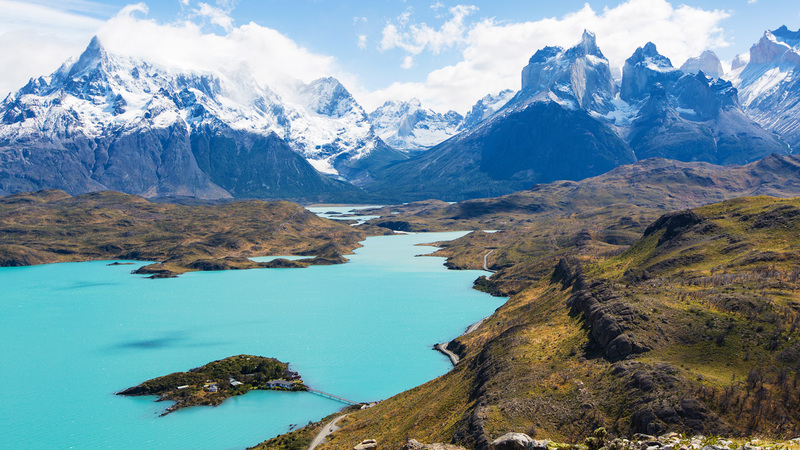 Embark on a six day long voyage into the stunning landscapes and unique lodges of the Torres del Paine National Park, nestled in the wonders of the Chilean Patagonia. 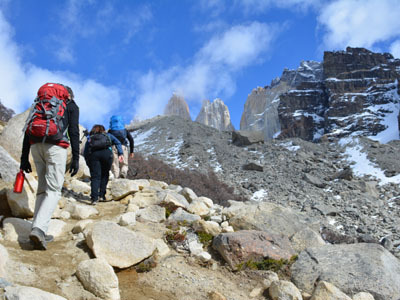 The trails around the jagged mountain peaks in Torres del Paine form one of the world's most classic trekking routes. 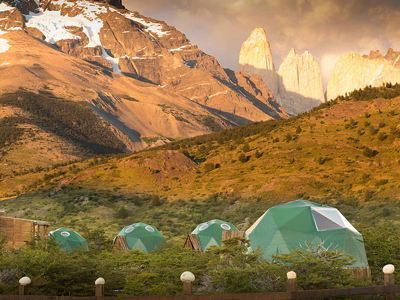 This active trip will lead you through forest, mountain ridges and Patagonian steppe and allows you to relax with food & wine, good company and unique accommodations in the evenings. So, grab your gear and let the memories begin! Today's journey starts off with a pleasant walk through the sinuous Cuernos Trail. This scenic route will lead you alongside the beautiful Lake Nordenskjold. During this warm-up walk, you will have the opportunity to admire the park’s exquisite flora and fauna, complimented by the magnificent views of the park’s central lakes. You may even catch a glimpse of the Paine’s Horns, majestic black horn-like peaks of slate atop gray granite, which crown the center of the Massif. After breakfast at this morning, you will begin the challenging trek to Valle Frances (French Valley), along a steep trail that leads to the very heart of the Paine Massif. How far into this venture you go, depends on your group's trekking rhythm. A swifter walk will lead you to the hanging bridge over the French River, located at the foot of the south east face of the Massif, where you will be treated to fantastic views of the valley. You will then continue to ascend towards the upper section of the valley, where you will be able to marvel at the extensive mass of the valley's geological formations: Hoja (Blade), Máscara (Mask), Espada (Sword), Catedral (Cathedral), Aleta de Tiburón (Shark’s Fin) and the magnificent Fortaleza (Fortress). After the upward trek, relish in some time to rest your legs and settle down for a picturesque picnic. Today's trek will finish up, as you descend through an undulating terrain of mixed grassland and light forest. Please note that an optional trek to Mirador Britanico is also available today, should you be interested. Today, you will embark on a hike along the shores of Lake Pehoe to the northern side of the glacially beautiful Lake Grey. 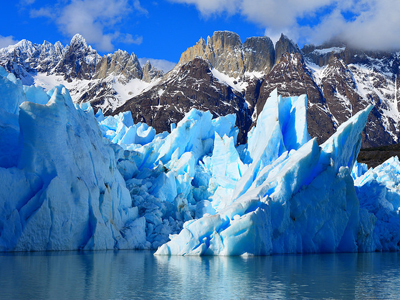 Here, you will feast on a picnic lunch before boarding the boat that sails right to the huge, crystalline facade of Glacier Grey, where you will have plenty of time to marvel at the calving glacier. Due to the temperamental weather of the region, boat trips across the lake may occasionally be restricted during Shoulder Season (October and April) or cancelled if the required minimum of 10 passengers is not reached. If either is the case, you will trek up to the sightseeing point and profit from wonderful, panoramic views of the Glacier instead. 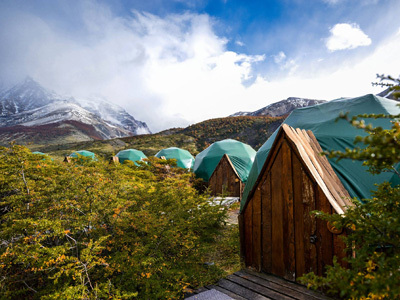 Afterwards, you will return on foot to Paine Grande and take a catamaran to Pudeto’s dock, where you will be picked up and driven to EcoCamp. An optional kayaking excursion around Glacier Grey is also available today, should you be interested. You've reached day five of your six day trek, and the exciting goal of today will be to complete the most famous trekking trail in all of Torres del Paine National Park! You will take off from Ecocamp this morning, walking towards Hostería Las Torres, before ascending to Ascencio Valley on the Tower's eastern face. Mountain ridges, beech forests and small rivers line the scenic walk towards the valley. Your big challenge will come in the form of the steep moraine, a huge mass of boulders, which will lead you to that iconic base-view of the Towers - Three gigantic granite monoliths, the remains of a great cirque sheared away by the forces of glacial ice. After a tough uphill climb, the Towers eventually come into full view, rising majestically before you, with the glacial lake visible below. Is there any better place in the world to have lunch? After feasting on the view and your tasty picnic, you will backtrack along the same trail through Ascencio Valley and return to EcoCamp for a well-deserved dinner and comfortable night's rest. Tour: Adios Torres del Paine! This is just one of many authentic travel experiences offered by Global Basecamps. 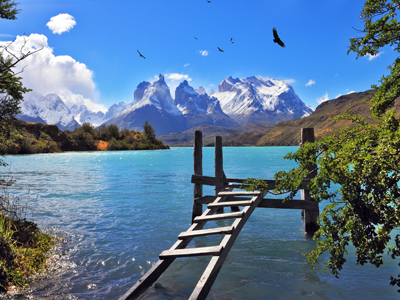 If you are interested in more unique destinations to Patagonia with unprecedented planning and extraordinary service visit our main Patagonia tours page to browse other sample trips.